And Here We Go! 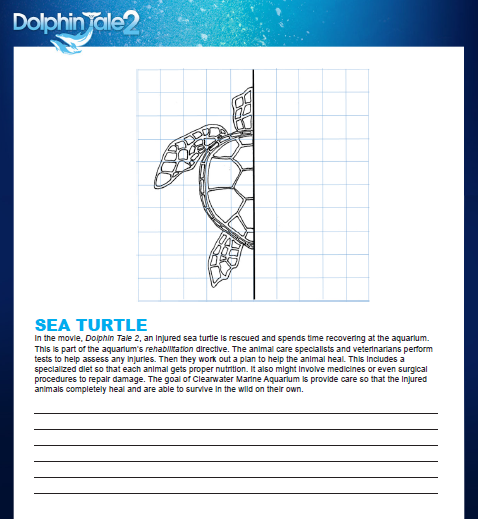 : Dolphin Tale 2 Curriculum Review + Giveaway! 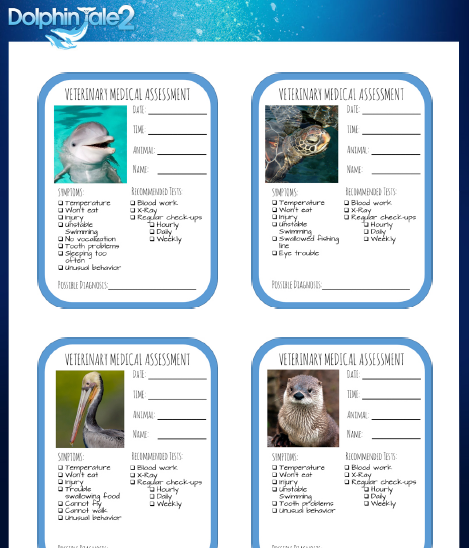 Dolphin Tale 2 Curriculum Review + Giveaway! 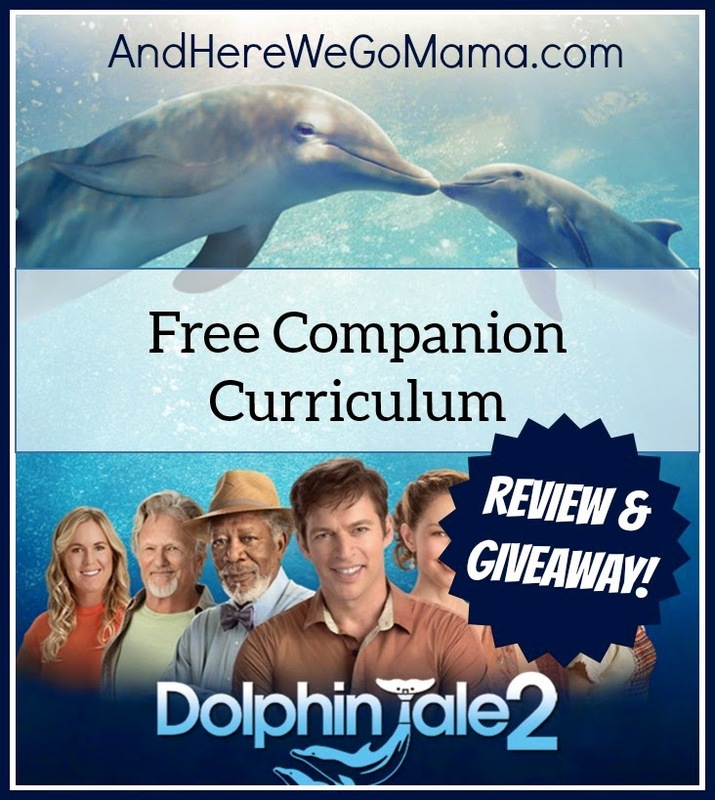 When I was offered a chance to review the new free companion curriculum for Dolphin Tale 2, I was SOOO excited! First, because we needed something. Something new and exciting. Warning: slight tangent ahead... Doing Classical Conversations, and I suppose just homeschooling in general, with just one child may seem like a dream to some, but it has its challenges. With CC we're told to just get little ones to memorize the weekly memory work, don't get too deep, just the facts, Jack. Well, that's what Mary and I have been doing, but I feel like I'm just quizzing her all. the. time. And, honestly, that's not fun. It's either right or wrong, there's no fun discovery and 'wow' moments together as we learn things. And I'm not criticizing CC or the classical homeschooling method - it's just difficult to fill the time when you're only working with one child. Review CC, do Math, Handwriting, and um... then what? That's been my problem so far with homeschooling my first-grader. We do a couple other things, too, but we do a LOT of 'training the brain to retain,' which is beneficial. I LOVE that we've stuck with our IEW poetry memorization program and memorizing Shakespeare passages. LOVE, love, love, LOVE that we continue to do these consistently - they will help Mary so much in the future with writing and just being a well-rounded young lady! However, we just don't have the fun stuff that I remember from my own first grade experience. School has quickly become a check-the-box chore to hurry and get through so we can go do something else. That's not what I think homeschooling should be for our family. Soooo, (tangent wrapping up) when this opportunity came along to learn about dolphins in anticipation of the release of Dolphin Tale 2, well, I thought, let's give it a shot! Let's actually learn and discover something together! We have so enjoyed the lessons and discussions! There are lessons involving Art, Math, Geography, Biology, and careers in an aquarium. Click here to download the FREE curriculum. Classical Conversations also put together its own 70+ page curriculum to go along with the movie, and it can be found at that link, too! Click here to hear from the author of the curriculum (one of Apologia's amazing writers!). Click here to visit the official movie website. Click here to visit Clearwater Marine Aquarium and see Winter live! After Mary and I completed the first lesson, we watched a YouTube video of Sea World's show Blue Horizons dolphin show. We were HOOKED! Then we watched the original Dolphin Tale that debuted in 2011. Oh, love, love, LOVE! We've also been reading our Usborne Whales and Dolphins book and checking out the internet links (you just know I've got to throw my Usborne in here!). Sooo cool! We are now all about dolphins! If I could go back and do it all again, I would totally become a dolphin trainer, I really would! What an amazing job! We're wrapping up our dolphin study by taking a field trip to see Dolphin Tale 2 this Friday at our local movie theater! We rarely go to a movie that's not at the 'dollar theater' (thank You, God, for dollar theaters! ), but we want to show our support for this family-friendly movie, so we'll be there! If you can, please join us! Go ahead and watch this trailer - you'll be hooked, too! 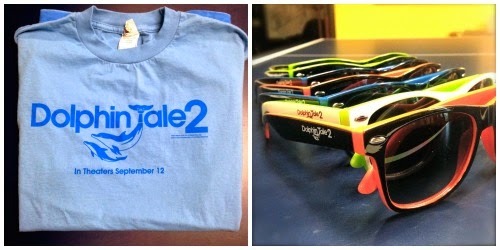 Also, I'm giving away one Dolphin Tale 2 shirt and sunglasses! Woot! The shirt is a beautiful blue, very soft, and mine was an Adult Small. I wish we could pick the sizes, but that is just waaaaay too complicated for a giveaway like this. So, if it won't fit you (yeah, I don't wear an Adult Small! ), I bet your kiddo would love to wear it! Yep, I got a free shirt and sunglasses, and they're pretty awesome. And I'd love for YOU to win them, too! Enter below for your chance. The winner will be announced Friday, Sept. 19! So, now that we're ending our dolphin study, what are Mary and I going to do to keep discovering and learning together in addition to our memory work? The final frontier! What else would we start with in Rocket City, right? Dolphins are believed to be very intelligent. Dolphins can attack and kill sharks. Dolphins communicate with each other by clicking, whistling and other sounds. We love the tv program Flipper from the 60's and watched Dolphins Tale(the first one) and would be fun to watch Dolphins Tale 2.